Congratulations Victoria on your 150th birthday and everything you do for the fine art of craft brewing. 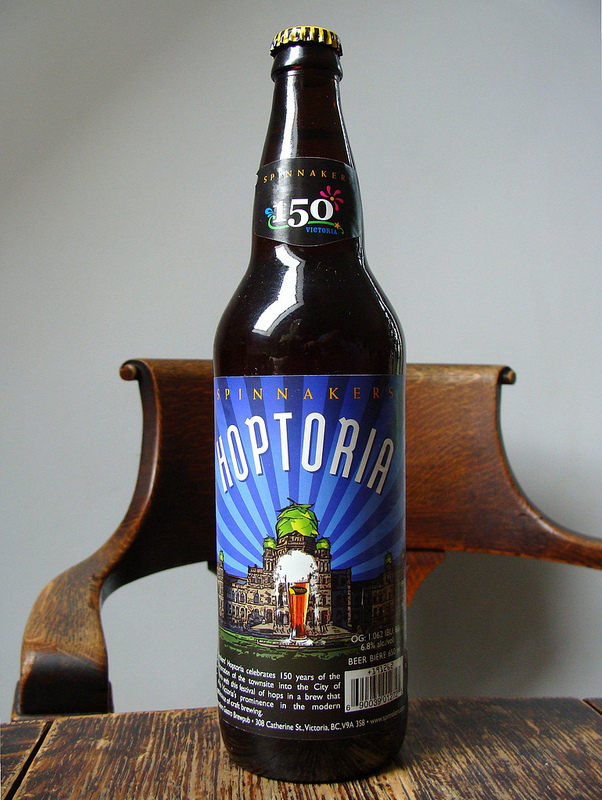 That appears to be what this new release from Spinnakers is all about, also known as Hoptoria India Pale Ale. And just in case the name wasn’t indication enough, this beer is a tribute to its hometown and even features a picture of the BC Legislature on its label, known to locals as the Ledge. Brewed with a combination of local and international malts, an array of Northwestern hop varieties, and then dry-hopped for added flavor, this beer is a fitting example of a Pacific Northwestern (aka.Cascadian) India Pale Ale. Combining hop strength, strong malts and a good alcohol content (6.8 alc/vol), it’s an all around great IPA that’s arrived on my doorstep just in time for summer! It warms my heart when craft brewing is honored, but when my hometown is honored for its history and contribution to craft brewing, well that just heats my heart to a near-incendiary degree! And it doesn’t help that the very thing conveying those honors is a strong ale, as such beers have only been known to intensify the nostalgia factor for me 😉 Congratulations Spinnakers and here’s to ya, Victoria! Keep on brewing! 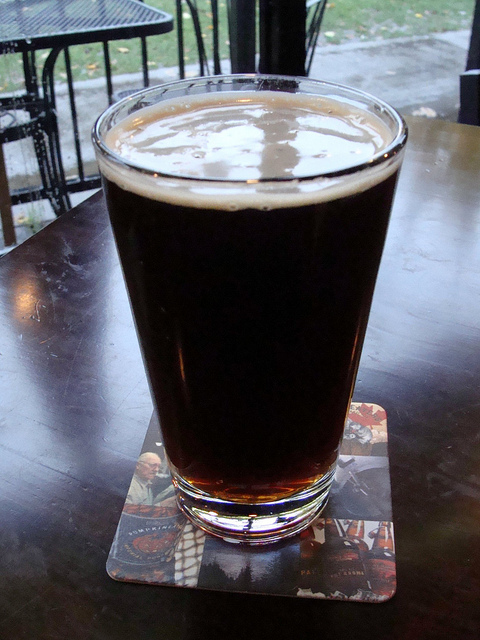 Next up in the weekend from Spinnaker’s lineup, we have the traditional cellar ale known as Jameson’s Scottish Ale. Though it is not a new brew, or particularly summery, it’s been some time since I sampled it last. As such, I could not resist picking it up so I could re-familiarize myself. And for the most part, I was pleased and not the least bit surprised. But that’s a good thing in this case. For many years now, I’ve known Scottish Ales to be rich, heavy and malty affairs that generally come dry hopped and smack of the peat moss and smoky flavor of Scotch whiskey. Named in honor of the Jameson clan who settled in Victoria in 1889, and grew rich of the tea, coffee and spice trades, this beer is a nice take on the traditional Scottish ale, being at once malty and complex, but lighter and less sweet than many of its stronger variants. In addition, the dry hop characteristics provide a slight bitterness that helps balance the flavor. 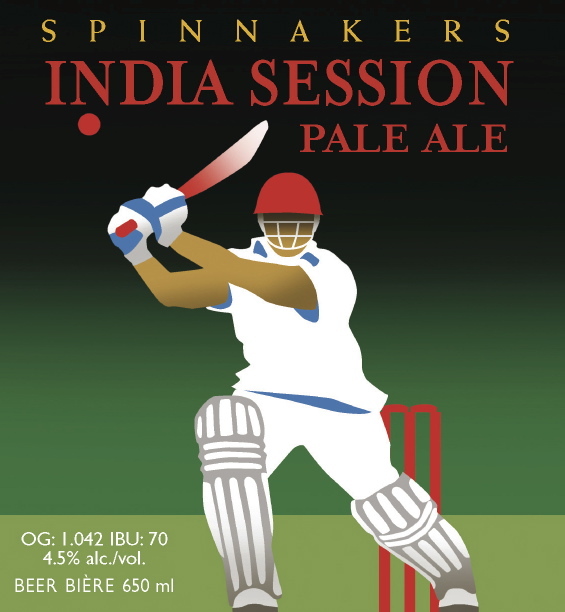 The first is the India Session Pale Ale, a combination session/India Pale Ale that’s come just in time for the summer season. Combining a session’s drinkability with the long and venerated tradition of IPA’s here in the Pacific Northwest, this combination is one of many lighter ales that Spinnakers has been producing of late. Much like their Tour de Victoria and Discovery Ale, this beer is much lighter than their usual fare, but still manages to deliver flavor that will please the hop enthusiast. Overall, this beer is light, refreshing, and highly drinkable, with just enough of a hop bite to avoid being classified as “close to water”. It seems well suited to hot weather and tilted beers on the patio with friends. Cheers, and hope the weekend finds you all well! Red Racer has been on my hot list lately. In fact, until recently it was one of craft brewing’s best kept secrets as far as I was concerned. Now, I know what just about every fan of micro-brewed beer knows, which is that this Vancouver brewery can output some seriously fine beer. But before you think I’m fawning, let me assure you that this reputation is well earned. Usually, I like to sample at least three beers from a brewery before giving them a stamp of approval. Because, let’s face it, any brewery that makes a few fine products, but surrounds them in a deluge of watery or skunky beers isn’t worth its keep! However, when you begin to sample from a brewery and you find yourself approving of every beer you’ve had thus far, you got to assume they are doing something right. And just for an added treat, here is a clip from Red Racer’s own website with Garry Lohin, Red Racer’s brewmaster himself, describing the product. Enjoy! Don’t I feel privileged! It seems that I came into possession of a bottle of Unibroue’s Grande Reserve 17. 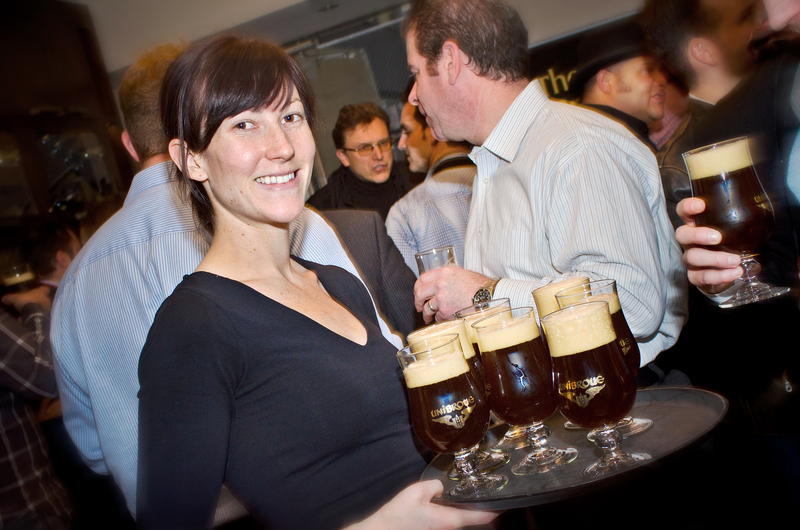 Back in 2007, Unibroue commissioned this specialty brew in honor of their 17th anniversary. Seems a bit random, but who am I to complain? Having looked into this beer’s background, it was apparent that it was not widely distributed. How to explain then how I just found it in a Cowichan Bay Liquor Plus right outside of town? I guess they got that distribution problem licked! Needless to say, I was intrigued, bought myself a bottle, and began sampling as soon as I got home. To break it down succinctly, this is an extra strong brown ale (10% alc/vol) that is refermented in the bottle (much like all of Unibroue’s products) and also aged in French Oak. In many ways, I was reminded of Trois Pistoles, another extra strong brown ale made by Unibroue which has been known to kick things up a notch! But of course, they go a step further with this special reserve, aging it longer, and in oak, which makes for a stronger, suppler taste. Yeah, I’ve come to approve of just about anything Unibroue produces. But that’s only because they have never disappointed me with any of their products. This latest installment in the growing lineup of Unibroue products that I’ve sampled only adds to the ball. An Ode to Beer Boots! According to legend, the tradition of drinking beer out of a boot goes back to 16th century Germany, where students enjoyed having a few beers, then dueling it out! As midnight neared, duelers laid down their swords and filled their boots with their favorite lagers. This is where the term “fill your boots!” became a popular saying, which loosely translates to “help yourself”. Naturally, it wasn’t long before health-conscious craftsmen began to develop boots made of glass specifically for this challenge. Then, whenever young men felt like a challenge, they could ask for the boot to be filled and demonstrate their drinking prowess by drinking it down without spillage or vomiting. Apparently, drinking the incorrect way would result in having to “wear the boot home”… Ouch! To my knowledge, there are only two places on Vancouver Island, possibly even in BC, that carry on this venerated tradition. 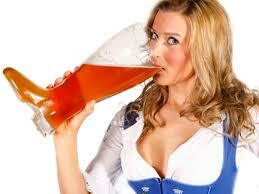 The first is the Rathskeller Schnitzel Haus, located right in the heart of downtown Victoria. Here, beer can be enjoyed in a 2 liter boot, 1 liter boot, or the personal .5 liter boot. And of course, drinkers can treat themselves to anything on tap, which includes Hackser-Schorr, Warsteiner, Holsten Lager, Festbock and Maibock, Spatenbrau Heffeweizen, Spatenbrau Oktoberfest (available only in the fall), Schneider-Weisse, and Konig Ludwig. The second is located at the Rim Rock Brewpub in Port Alberni, at the cross-roads of Vancouver Island. A relatively new operation, the Rim Rock has the added distinction of being attached to Nanaimo’s Longwood Brewpub, one of my personal favorites. Here they have the wort for their beer brewed, which is then transported to the pub in Port Alberni where it is fermented. Thus far, they have a lager and a pale ale on tap, both of which can be served in the boot! Hello all and welcome back! It seems like it’s been a whle since I’ve tried new beer. Well, you can blame my new favorite brewery for that. Yes, Hoyne brewery sells growlers at pretty decent rates, so the wife and I have been simply getting them refilled week after week. Not a bad deal! However, I managed to get out to the beer store earlier this evening and managed to find some news one I haven’t tried yet. 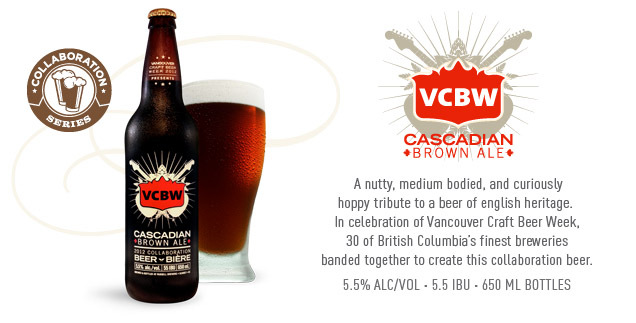 Cascadia Brown’s certainly appear to be making the rounds these days. First there was Spinnakers , then Granville Island Brewery, and now this one. And I have to say that this is definitely my favorite of the lot! By bringing together characteristics of a Brown Ale with a Northwest Pale Ale, they’ve really struck gold. At once tawny, bitter, rich and malty, it’s definitely in keeping with the best traditions of Vancouver craft brewing. I still can’t believe 30 breweries were able to collaborate on this, but as long as they keep making em, I will keep buying em!